There has been a castle overlooking the Vale of Belvoir (pronounced "beever") since the Norman conquest. 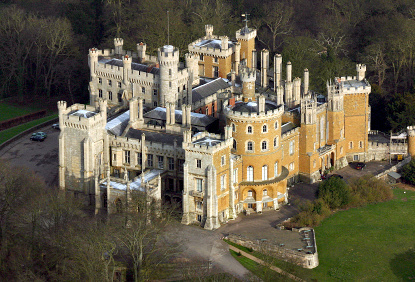 The present medieval-looking Belvoir Castle is, however, a fourth reconstruction from the 19th century, after partial destruction during the Wars of the Roses, the Civil War and a major fire in 1816. Belvoir is home to the Duke of Rutland and his family, although a large part of the interior is open to the public during the tourist season. The Elizabeth Saloon, State Dining Room and Regents Gallery are only some of the many sumptuously decorated rooms. The castle is filled with French furniture, Italian sculpture, porcelain, tapestries and paintings by great names such as Gainsborough, Reynolds, Holbein and Poussin. Guard Room has a fine array of weaponry and medals. Those with further interest in military exhibits will be delighted by the Queen's Royal Lancers Museum (admission £8). Belvoir Castle is open daily (except Fridays and Mondays) from 11am to 5pm (last entry 4pm) between Easter and September. It is also open on Sundays only in March and October. 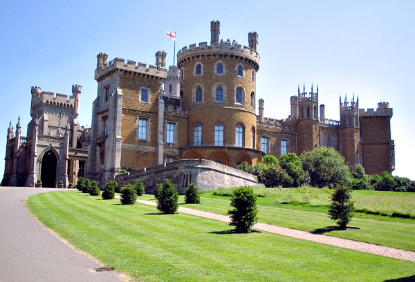 Belvoir Castle is located about 10km west of Grantham, off the A1 road.